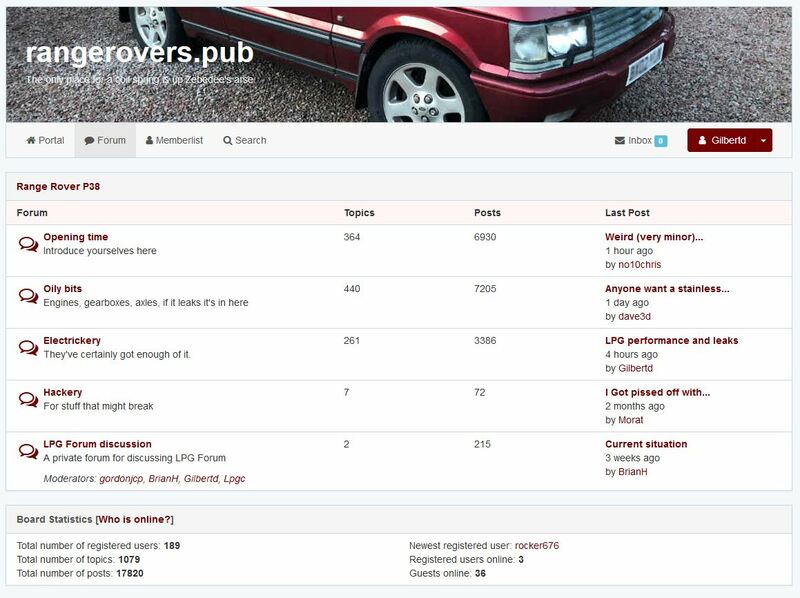 On the home page of the forum it shows that I have unread threads in the Opening Time section - the speech bubbles to the left show red. When I open Opening Time all of the threads have white speech bubbles to show they've been read. I then click the "Mark as read" button and that fixes it on the home page, until there's a new post made. I read this new post, everything shows as read again and I go back to the home page. It only seems to be happening with Opening Time. It's always been like that for me and not just on Opening Time, also on Oily Bits and Electrikery (although not on Hackery). All I've ever done is read the threads then click on Mark as Read before coming out of it. It seems to affect some people and not others and the theory is it's something to do with the operating system and browser being used. I've not had it before and it's happening for me on a variety of operating systems and browsers! Chrome and Edge on Windows 10. Ah, Hackery might only be accessible by mods, it appears below the others along with another one about the LPG Forum which is only available to a few of us. I assumed it was something my end as LPGForum is the same, things aren't automatically marked as read, I have to manually do it. I don't see the LPG forum. Just Opening Time, Electrickery and Oily Bits. How many other sections are there? I’ve never seen lpg forum, just talk about it being added. This is what I see. The Hackery forum was added for people who wanted to get deeply involved in reprogramming various software bits and it all went completely over my head (but I suspect I can see it as I'm a moderator) but it then seems to become a private forum for moderators and the LPG Forum one was added when it looked like we would be taking over the LPGForum (www.lpgforum.co,uk) as the previous owner was talking about closing it and was a closed forum for a few of us. Interesting, I have never seen the Hackery and LPG Sections .... signed in or not ! But, trying to view it. it tells me it is 403 / forbidden !! I like how it says it is for "things that might break"... but that's applicable for many things on a P38 surely ?! Ok, I am intrigued: How much is it to view... or do I need a special handshake or something ?? You won't. Hackery is only visible to moderators and the LPG section is, as it says, only for Gordon, Brian, me and Simon. Pretty much obsolete now that the hosting for LPGForum has been changed and the software updated but it was used to discuss the way forward and whether it was going to be incorporated into this site or run alongside it. This behaviour happens after a mod deletes a thread without hiding it first. I've tested it before and now I always hide the spam before deleting it. No Morat, different thing. If a mod deletes a spam message then the heading shows Opening Time - No posts unless they hide it first then delete it (or delete it and immediately post something else). This is where from the main page the filled in blob shows there are unread posts in one or other forum. You then go into that forum, the unread post has a filled in blob next to it so you read it. When you go back to the main page, the blob is still filled showing unread posts but when you go into the forum, there aren't any as you've just read them and the blob is now not filled in within the forum. The Hackery forum was started when there was talk about hacking the BeCM and firmware for some of the other subsystems and it was decided to keep it private so people wouldn't start playing with things the didn't understand and screw them up in a big way. You only have to look at some of the suggestions on the dark side about fiddling with the immobiliser/central locking, etc to 'improve' it to see just how stupid some people can be. Typical little knowledge being a dangerous thing activities. However, if memory serves me right, Davew has been involved in a bit of software digging so access to it would be worthwhile (even though there's been nothing posted in there for months now). It happens to me as well, but only on some of the sections here. I've just got used to going back to the section and hitting the mark as read button when i'm done in that bit. I think its the opening time and oily bits i find it on, the other ones don't do it. Its nowhere near as annoying as having to approve your own posts though. It's all a bit beyond me - I fumble my way through the forum and hadn't realised that LPG was no more. Does this mean I can't ask questions on LPG anymore - I see it is 'forbidden' when I search ! Also, I'm not good at starting messages to people and I did once mention that I made a mess of trying to sign up for the forum and could not log on so three of my membership attempts are invalid (no password or inaccessible) but listed. For neatness they could be removed - they are 231 Seeba, 232 seeba and 233 superviv. I finally succeeded with super4 ! Not sure what you mean @Super4 but you can ask LPG questions on this forum or LPGforum if you're a member of LPGforum. The LPGforum section on this forum was, as Gilbert said, just for the few of us that were rescuing LPGforum at the time. You don't need access to that section of this forum to ask questions about LPG, you could just start a thread in (say) the Oily Bits section. Ok, thanks for that - all clear now - my LPG is more or less ok but I still have strange running probs common to both and still have to change the crankshaft sensor to eliminate that as a possible problem and replace my coolant thermostat which has failed open and the engine does not get hot enough for the LPG to kick in ! Cold and muddy up there on my mountain and I'm loathe to try and get underneath !!! Leaving the car at the nearest garage while they do the work is a problem as getting home and about difficult - on my own here ! Aaaaaand now it's spread to the Electrickery section too. Any changes been made in the last 12 hours or so?